Happy New Year everyone! 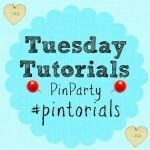 A huge welcome to Week 1 of the Tuesday Tutorials Pintorials Pin Party! This linky will occur fortnightly. Therefore this will be open for two weeks until 15th January 2016 so you have plenty of time to link with us! This week I am featuring Christmas food. The first recipe, Gluten Free Christmas cookies, is from one of my regular contributors – Herbs, Spices and Tradition. This is her daughter’s recipe. These cookies looks absolutely delicious! Next, we have these Penguin Cookies with Nutter Butter from A Little Pinch of Perfect. How cool do these penguins look! I think a lot of children would love these! Lastly, this is a hidden Christmas tree wreath cake which I made. This was quite a challenging cake to make so I am particularly proud of it! Don’t forget to pop by to take a look at Hodge’s blogs (Valentine crafts) to see who is featured this week. First time joining us? Simply add your posts to the linky and they will be shown across our host blogs (myself, ET Speaks From Home and Hodge Podge Craft) and then pinned to our group board. Every two weeks, the 2 of us will showcase a selection of three posts each to feature the round up on our blog along with the following weeks’ linky.